We are getting many 3020-a cases where a tenured teacher or Guidance Counselor is charged with grade-changing, falsifying grades, not complying with Department policies, and similar such stuff. This theme is the flavor of the 2017-2018 school year, it seems. If a student genuinely needs extra credit due to circumstances particular to him/her, then, of course, we support the teacher working with the student on credit recovery, extra homework, etc. All kids need a chance to succeed. But few students (there are special circumstances, IEPs, etc.) need to be socially promoted to graduation if there has been no effort or attendance. If you are told to change the grades of your failing students, and you feel that the request is improper, then read further. The department is trying its' best to shove great teachers under the bus, and we understand that game: put the blame on the teacher/Assistant Principal before someone blames the principal or goes to the media. Principals are always immune to prosecution, so the best thing that a teacher/AP can do when a Principal calls him/her into the main office and tells the person to change the grade on a Transcript Update Form or on something else, say "let me take this and I will get it back to you". Go to your computer immediately, and write up the meeting, send the transcript update form to your UFT rep and the Superintendent with your reasons why this is improper. Ask for assistance in what to do. Stop the principal from cleaning his/her wheels with your career. If you are charged with 3020-a specifications which charge you with any of the above, contact us. We got this. pushing for the scandalized city school system to clean up its act. 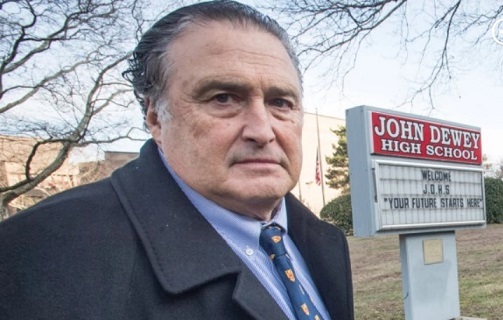 Five years ago, teacher WADE R. GORIA exposed a massive grade-fixing scheme at John Dewey HS in Gravesend, Brooklyn, along with his colleague Michael P. Klimetz. Their revelations led to a state audit, released last month, that confirmed the shocking truth: School leaders had committed wholesale fraud — and cheated students out of the education the city was required, by law, to provide. Here, in an open letter, Goria says how grade-fixing fraud is still widespread throughout the system and asks the new schools chancellor, Richard Carranza, to stop the rot . . .
Our union failed us. The UFT chapter chair in all NYC public schools is required to review each teacher’s program to ensure compliance with the contract. Had this been done, the rug would have been pulled out from Elvin’s scam. The UFT’s Brooklyn representative was fully aware of the violations but failed to address our pleas for protection. Michael and I reported Elvin’s massive fraud to Brooklyn Superintendent Michael Prayor, the Department of Education’s Office of Special Investigations, the Special Commissioner of Investigation and members of the state Board of Regents. We naïvely assumed the system would intervene and halt these unconscionable practices. More than 1¹/₂ years later, on June 30, 2015, the OSI finally issued a scathing report. But it detailed just some of the fraud and named only Elvin and two assistant principals, though most of the assistant principals and guidance counselors took part. A week later, Elvin was removed from Dewey amid intense media coverage. Yet, as we would learn a year later, it was all a charade. We believe Fariña never intended to hold Elvin accountable. It took the state Education Department five years from the time they were first alerted about this outrageous scandal to issue an audit on March 25, finding that thousands of improper credits were awarded to Dewey students. But the audit gave no explanation of how the scam was carried out. It was like confirming a murder without describing how the victim was killed or who committed the crime. The Board of Regents has yet to hold any guilty parties accountable by revoking their licenses or certifications, or by levying fines. This stands in stark contrast to the handling of a major cheating scandal in Atlanta 10 years ago, when prison sentences were meted out to corrupt educators. More recently, the Washington, DC, school system issued a swift and far more thorough report following media reports that Ballou HS had fixed grades and graduated students whose low attendance failed to meet requirements. 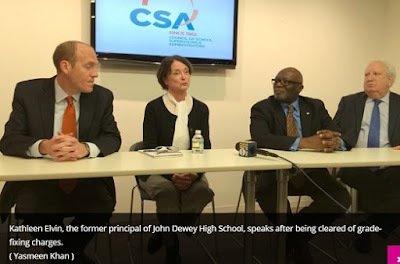 A once vaunted and proud institution, Dewey now boasts an 80 percent graduation rate, but last year 48 percent of the grads didn’t have test scores high enough to enroll in CUNY without remediation. Several assistant principals and other staffers who conspired with Elvin still work at the school. Elvin was awarded a post at the DOE’s Tweed headquarters and now collects $170,000 a year in the Office of Safety and Youth Development. Chancellor Carranza, at the outset of your tenure, you are faced with a choice: You can stop the spread of the grade-fixing contagion by finally applying consequences for criminal fraud, or you can let the DOE further descend into self-serving degeneracy. An arbitrator ruled to dismiss all disciplinary charges against Kathleen Elvin, the former principal of John Dewey High School in Brooklyn, who was removed from her position on charges that she ran a sub-standard credit recovery program. On Wednesday, Elvin expressed relief at the ruling. She said the allegations, her removal as principal and the media coverage of the issue amounted to a "character assassination." This was the latest twist in a story dating back at least to last school year when investigators looked into teachers' complaints that even students who did little work and had low attendance rates passed courses designed to help them accrue credits required for graduation. The arbitrator, Jay Nadelbach, wrote in his ruling that city education officials validated the credit recovery program when it certified the credits received by students, thereby allowing students to graduate. "If all the course credits were accepted and validated," wrote Nadelbach, "how can the Respondent be charged with misconduct for allegedly administering substandard courses?" The union representing public school principals, the Council of School Supervisors and Administrators, applauded the ruling, and called the Wednesday press conference with Elvin. "It was very difficult to actually read about myself and not recognize that person they were describing in print, because virtually none of it was true or accurate or clear in communicating what had gone on in the school," Elvin said. 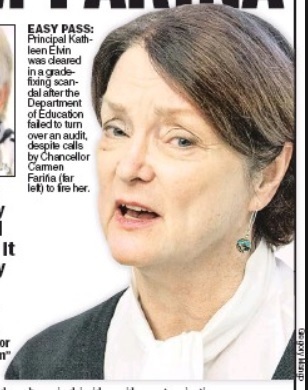 After she was removed from John Dewey in July she was suspended without pay. In March, she returned to the payroll, following an earlier ruling by the arbitrator. The most recent decision entitled Elvin to full back pay and reinstatement as a principal. "We are disappointed with this decision, and we are continuing to review our options," said Devora Kaye, a Department of Education spokeswoman, in a statement on Wednesday. City education officials, according to a summary in the arbitrator's ruling, called the motion to dismiss disciplinary charges "premature and inappropriate." Instead, they wanted a full hearing to terminate Elvin's employment.